Rx Systems is another brand that I go way back with. I started using their products when I was working at a salon about 8 years ago. I have those lovely little bumps on my upper arms and legs...so, one of the aestheticians advised me to give the Rx Systems Reparative Body Wash a try. I did, and boy was I impressed. It worked better for me than anything else I had ever used. Since I loved the wash so much, I also began using the Rx Systems Reparative Body Cream in conjunction with the wash. The results? Even better so I was obviously hooked. Rx Systems is a comprehensive product line that offers products not only for skin, but for hair as well. I love the fact that the categories and products are easily divided up making it a breeze to select the product you actually need. If you are looking for a new anti-aging line, then definitely check out this brand. They offer a unique, customized blend of glycolic and alpha lipoic acids called the Glypoic Complex. This fabulous combo provides you with the benefits of glycolic (removal of dead/damaged skin to reveal new brilliant skin) and the benefits of alpha lipoic which is not only required for new cell growth, but also assists with cell metabolism. The alpha lipoic acid will actually attack free radicals that damage normal cell division and collagen formation and makes them inactive. This allows for even better and faster results! This is a product where you will continue to see improvements the longer you use the products. If you are wanting to give the Rx Systems products a try, then they offer spectacular trial kits including the Rx Systems Anti-Aging Skin Care System and the Rx Systems Acne Control Clear Skin System. The anti-aging kit includes a Reparative Cleanser, Reparative Cream, and a Facial Moisturizer with SPF 30. The acne kit includes a Acne Control Cleanser, Acne Control Lotion, and an Acne Spot Treatment. Both ot these kits are smaller sizes so they are perfect for a trial use and reasonably priced at just under $40. They are also great starter kits for those uncertain of what products they need. Rx Systems is one of our featured brands this week during our 12 Brands of Christmas promo. We will be giving away 3 kits...that's right...3 kits! Two anti-aging and one acne (exact same kits described above). Wanna win? Just follow us on Facebook for details, FREE samples, FREE professional advice, and more! 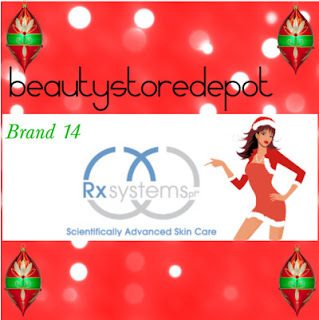 It's hard to believe, but Rx Systems is our last brand during our 12 Brands of Christmas promo. We have given away thousands in GRAND prizes and have loved providing so many of you with professional, personalized skin care recommendations. Remember, if you have any questions or concerns with any of our recommendations, samples, or products that we are always available and happy to assist. Crossing my fingers on this one because both of the kits featured here interest me greatly. I am not sure which is worse...aging or acne...but I can positively tell you that trying to fight both can be absolutely exhausting! As always, thank you for the chance to win such amazing products.